The Last Station is a historical rendering of Leo Tolstoy's (Christopher Plummer) last years. 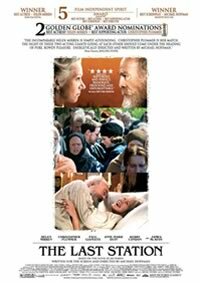 After almost fifty years of marriage, the Countess Sofya (Helen Mirren), Leo Tolstoy's devoted wife, suddenly finds her entire world turned upside down. In the name of his newly created religion, the great writer has renounced his noble title and his property in favour of poverty, vegetarianism and even celibacy. What's more, Tolstoy may have been persuaded to leave the rights to his iconic novels to the Russian people rather than his own family. Countess Sofya must use every strategy at her disposal to fiercely fight against the libertarian community that is installed in her house and to try to win back what she feels belongs to her.